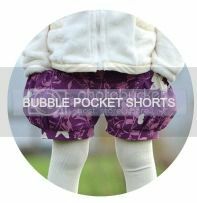 The realm of vintage clothing is, by far, what inspires me most when it comes to designing children's clothing. The textures, the colours, the lines, the construction...all of it speaks to me in a way nothing else does. The only real challenge for me, was how to decide on a particular era when I'm in love with so many! I tend to favour the 50s: the femininity of the garments for the girls, and the little gentlemanly features for the boys. But, I decided to take a different spin, into a place & time I've often admired, but never actually re-created: the roaring 20s. 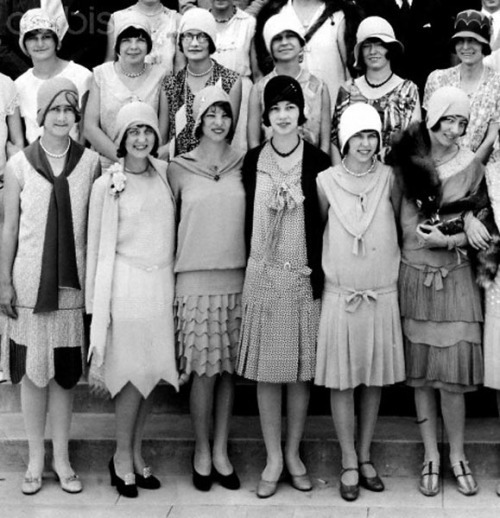 There has been a huge revival of 1920s fashion, most likely having something to do with the new movie The Great Gatsby that just hit theatres. The stunning costumes for the film were designed by Miuccia Prada. But I also wanted to look further back to the originals for my inspiration and found some real gems. And from there, I came up with my 1920s, flapper-inspired outfit: a little Gatsby. The overlay dress is made from a dusty rose coloured voile with a very subtle stripe for the bodice, with an ivory cotton lawn for the drop-waisted skirt. It's simple design is self-drafted, and often tweaked as I sewed. One of my favourite elements of the dress happened by complete accident. 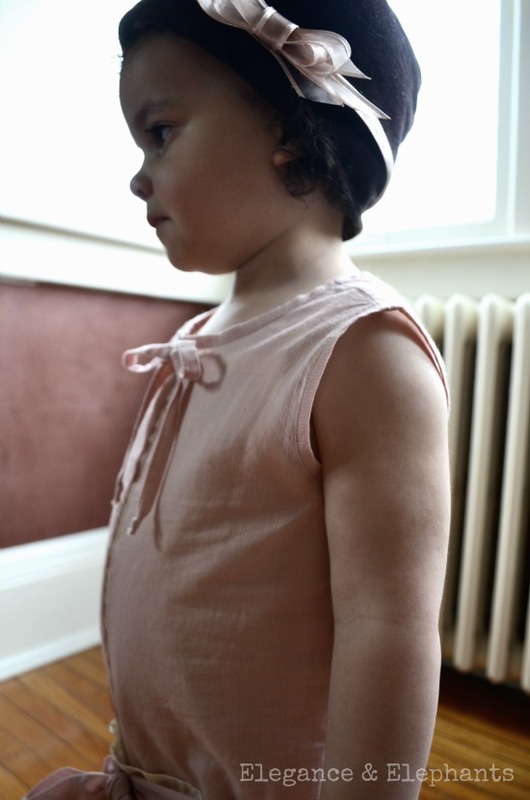 When I did my first fitting on Anja, I found the dress a little too tight around her cute, toddler tummy. My solution was to cut the bodice straight down the middle, and add some of the ribbon that I had purchased for the hat. 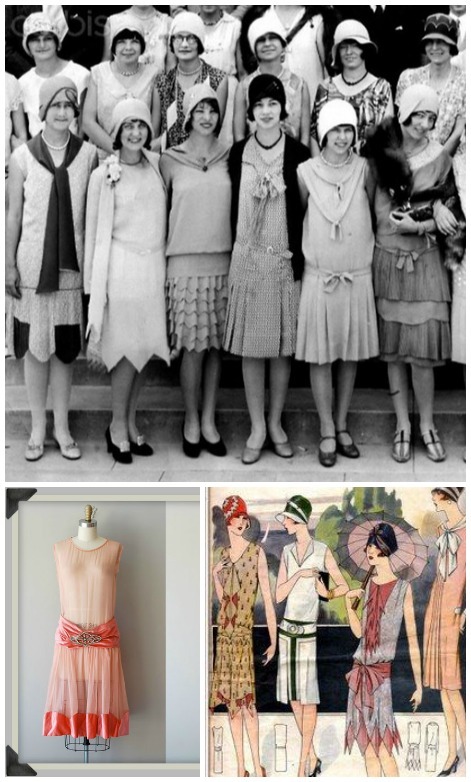 The result was a sheer front panel that created an art deco-like shape that was very typical of 20s fashion. I decided to balance out the use of the ribbon by adding a small piece of it to the back. It serves a dual purpose, not only decorative, but it also giving a bit of hold to the triangular shape of the back. 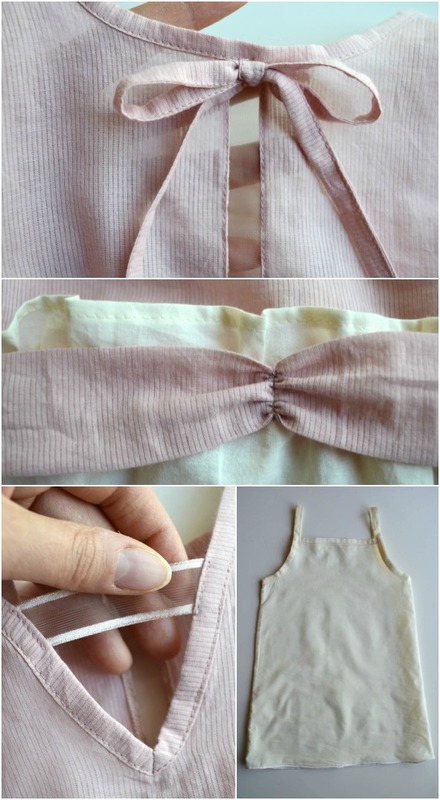 The slip is very simple and easy to make. 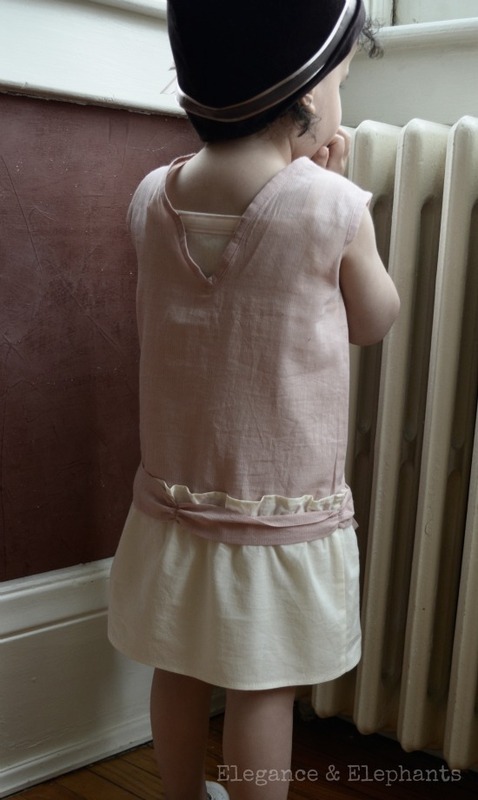 It's made from the same ivory cotton lawn as the skirt, and is a lengthened version of this tank top tutorial, with a rolled hem. This is the pattern I modified for the cloche hat. I love that it's a restored version of the actual original pattern. Did I imagine all the mom's who sewed from this same pattern for their little girls decades ago, as I was making mine? Maybe just a bit! :) The pattern recommended felt fabric, but I changed that by using chocolate coloured velveteen instead. It held it's shape quite well, but I chose to also add a felt lining, for even more stability. 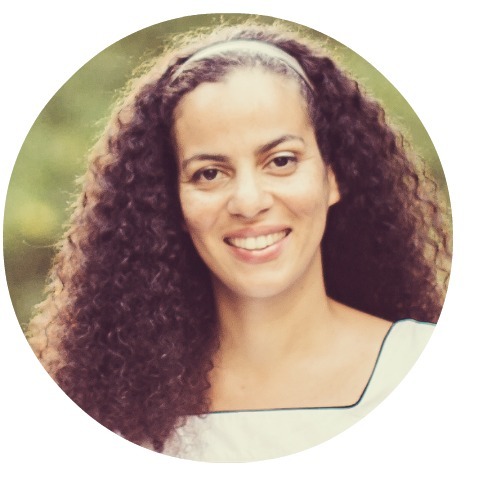 Thank you so much Kristin and Jessica for inviting me to be a part of this amazing series! Skirt As Top and Craftiness is not Optional is where you need to be to catch all of the Vintage May fun. 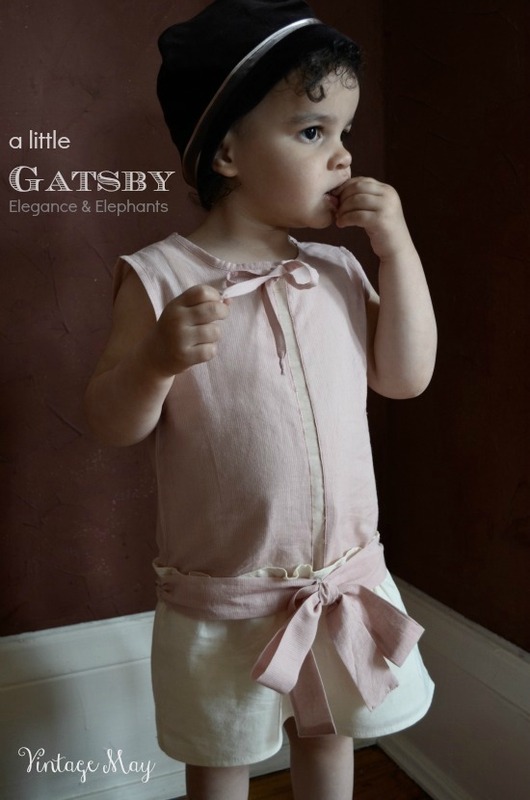 30 comments on "Vintage May - a little Gatsby "
Super cute!! It brings to mind Downton Abbey as well. I still haven't seen an episode, yet, but it's on my list of shows I have to see! ADORABLE! 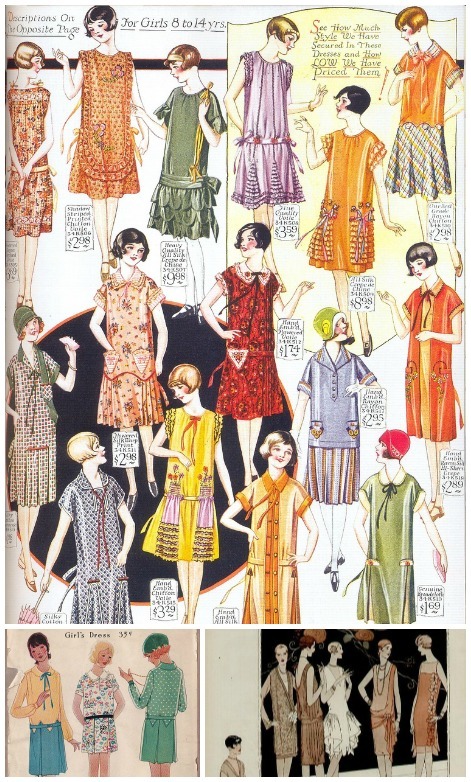 I'm obsessed with 20s clothing...and going to see Gatsby this weekend. Thanks! I hope to see it soon, too. Looking forward to seeing Gatsby too! I love this little outfit on Miss Anja. I especially love the ribbon adjustment down the center for her "toddler tummy". So adorable. *Those skirts in the black and white photo are just lovely. The hemline details are gorgeous! Wow, this is incredibly gorgeous! And thanks for the inspiration shots of old patterns from the era. I recently bought a kids' book called "When I was Small" http://www.amazon.ca/When-Was-Small-Sara-OLeary/dp/1897476388 that has the prettiest illustrations, and in one scene the little girl is wearing a twenties-style dress, and I had been thinking how nice it would be to make something similar for my daughter. This is great inspiration for that. Oh my goodness this is so adorable! 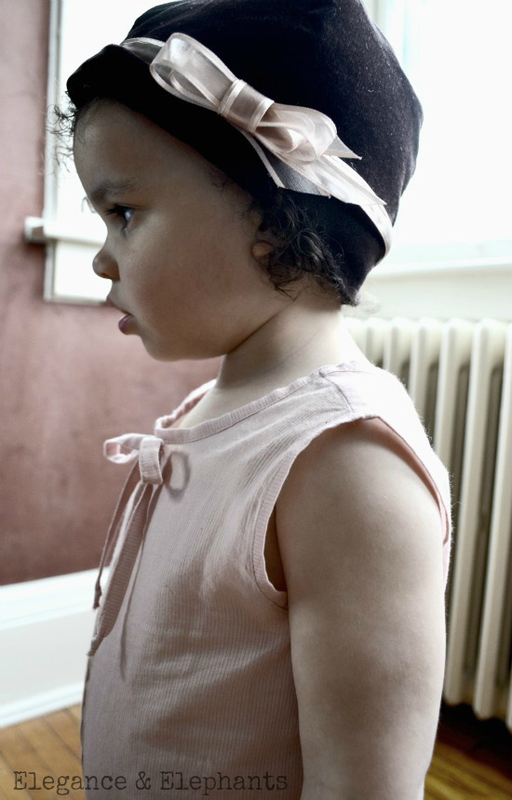 Oh my cloche....This is amazingly darling! I love it. Great job Heidi! HEIDI - I LOVE THIS!!!! Even more florred when I saw it was a slip and overlay - so period correct!!! And a cloche, so sweet! You are amazing, that is all! Adorable!! This has always been my favorite era when it came to clothing. I'll be seeing the movie for the costumes alone. Stunning, Heidi! You have serious skills, lady and I love the accidental ribbon detail so much! Anja looks fab and jazzy! Adorable! Love the ribbon detail! Great job! Just so pretty! And the perfect color too. This outfit is gorgeous!! The 20s is one of my favorite eras and I can't wait to see the Great Gatsby. It was one of my books in high school and I have re-read it many times since. It's so so so beautiful, Heidi! Thank you so much for being my guest - you knocked it out of the park! Too cute for words - and such a lovely model! So cute! Especially the hat! 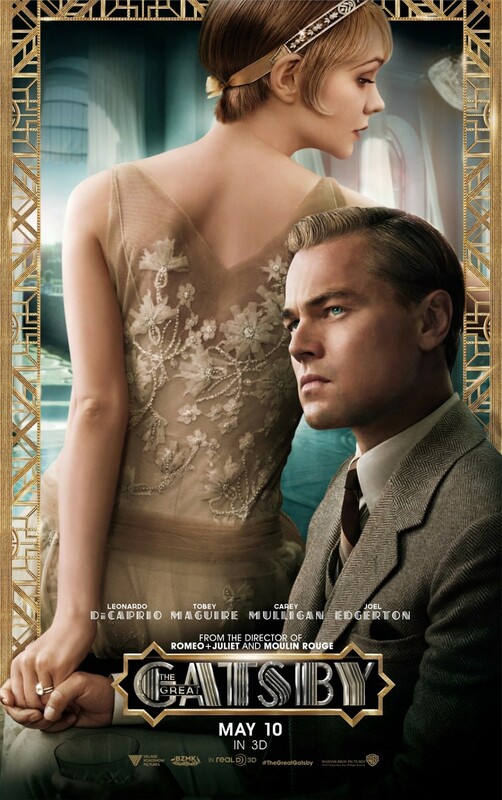 I adore this whole get up-I'm a big fan of Great Gatsby and can't wait to see the movie-the costumes look insane! Anyways, love the whole color palette and she looks just darling in it! Oh my goodness, this look is phenomenal! You seriously nailed it! 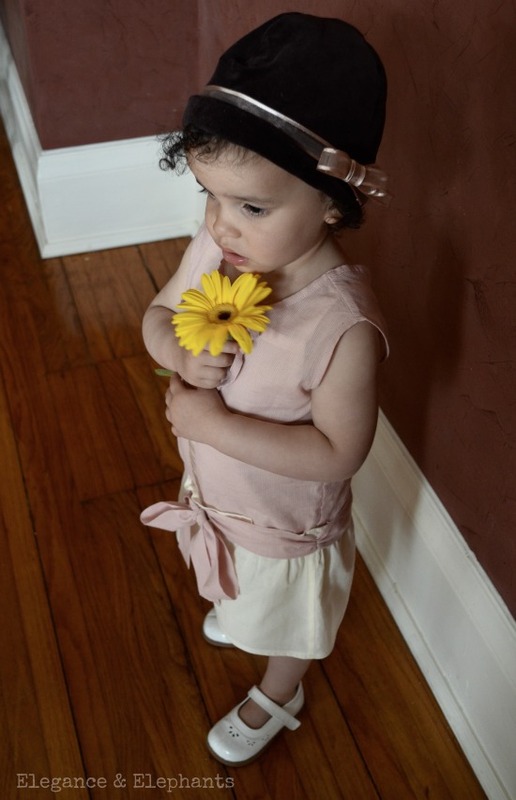 I honestly gasped when I saw this perfect little outfit. What a wonderful thought out post. Heidi, this is so amazing! The little hat, the top, the colors... perfect! SO cute! 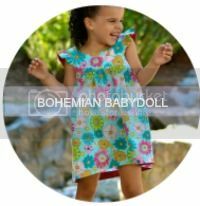 I love drop-waisted dresses on little girls, it is just adorable! So schön und elegant. Was für ein schöner Stil.